Volume 62 l. Opened-up height 33 cm, folded 8.5 cm. Width 59.5 cm, depth 39.5 cm. Weight 3.5 kg. This model holds 62 litres and comes with a load capacity of 60 kg. It will hold a static load of 180 kg. The wall thickness is 1.5 to 2.5 mm; a hinged two-part lid protects the contents from possible soiling. The box is the predestined warehouse and transport container for things which one only occasionally needs. It maintains order and provides an overview in the cellar or garage. Fold and Stack. 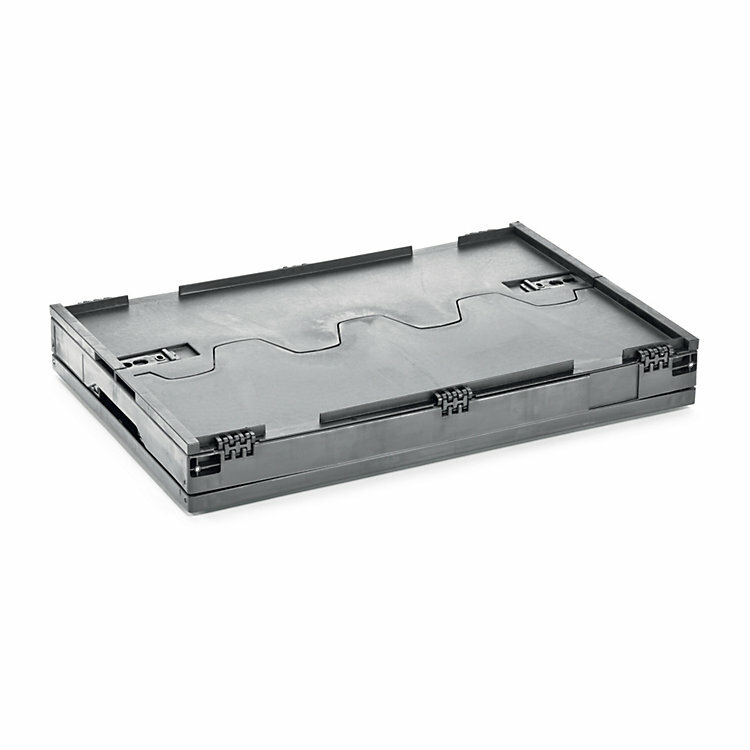 Rugged Folding Boxes from Germany. These folding boxes are painstakingly made to be close on to indestructible. The come with comfortable handles and haul a respectable amount. Done in simple grey, they are far from simple and a far cry from the usual boxes with their rickety construction and sharp edges, deficient load capacities and garish colours. With these boxes, the floor and the smooth inner walls are impressively thick and well-sealed, so contents are protected from dirt. The hinges are just as sturdy as the rest of the boxes, which pack up quite nicely when folded. They are made by Walther Faltsysteme in Kevelaer in North Rhine-Westphalia, a supplier for the industry. The firm spotted boxes like these in the 1960s in Japan and started producing them in Germany. The industrial origin is hard to overlook: the material, recycled from used boxes, has a high impact resistance and is UV resistant.